Well hello weekend and hello sunshine. 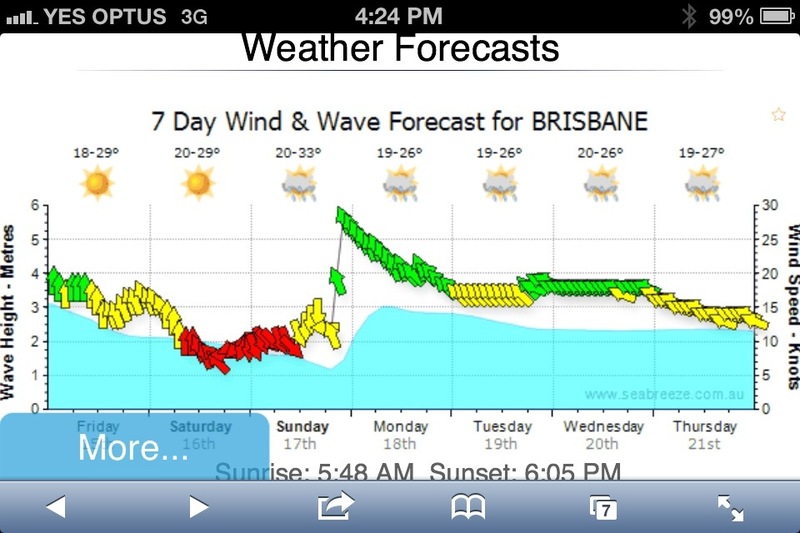 Our friends at www.seabreeze.com.au have forecasted a fairly nice weekend for once. The only reason I’m calling them our friends is because they are finally being nice with the weather forecast. It’s about time. Guess what? We can’t go boating!!! How frustrating. Look at what the wind is doing Sunday night! This weather is all sorts of crazy. Bring back our predictable sunshine, followed by sunshine, followed by sunshine. This weekend we have been signed up to participate in a triathlon, only doing one leg each as a team event, but neither of us have trained for it at all. Hopefully the skiing we did 6 weeks ago counts for something…… Uh oh. Check back in next week to see if we survived.